2-3 together on short stalks, ends of branches.4 thick white petals (cup-shaped). 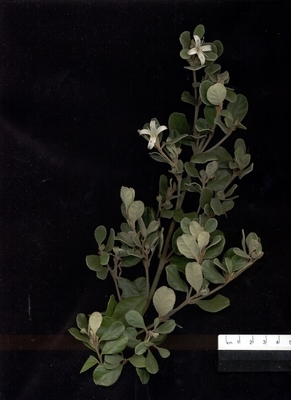 Shrub, broad leaves 1-3cm grey-green leathery. Many branches. Common in sandy soil on coasts.Sometimes grows in sand. The foliage was used by early settlers as a substitute for tea. A good low wind break or hedge. Attracts birds (honeyeaters). Suitable below powerlines. Seed released immediately on maturity. Most sources recommend leaching in running water for several weeks as seed contains chemical inhibitors. Some sources indicate no treatment necessary.